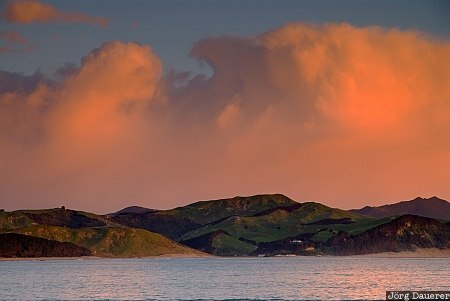 Colorful clouds above the coast of the pacific ocean near Castle Point at sunrise. Castle Point is in Greater Wellington in the southern part of the North Island of New Zealand at the Wairarapa Coast. This photo was taken in the morning of a rainy day in November of 2008. This photo is part of the exhibition Colorful Sunrise (October 2013). This photo was taken with a digital camera.